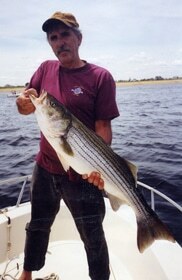 The Striper are getting ready to come out of the river, water is getting too hot and the Herring are headed down river. On the river at 4:45am for the out going tide. I know the only lure to take out of the box is my Frigg Walking Popper from Odin Lure Company. I load it up with Fish Smack and start casting. 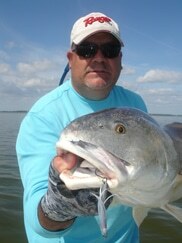 This time of the year the fish have only one thing on their mind: getting back to salt water. With my Helpless Herring 1.5 oz plug and Fish Smack I’m looking for some big ones. After a few cast this 34” Striper just could not help himself from having the last meal in the river. There has to be some more out there. When we went out fishing there were at least 40 other boats in the same area. It was kind of an over-whelming sight. 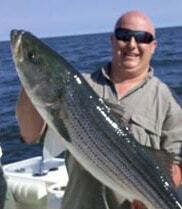 When the Stripers surfaced they were right around our boat and we were the only ones catching them. Once the other boats saw the fish we were bringing in they started shadowing us. They did not have Odin Lure Company lures and Fish Smack. We were the only ones catching fish. The Odin Lure Fish Catching system is my secret weapon. 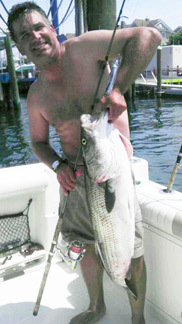 Anthony DeiCicchi – On The Water Magazine & T.V. Capt. 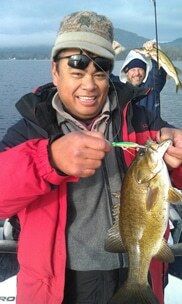 Pete Santini of Fishing Finatics was sent some of our new jigs to see if they would work out on the Galapagos Islands. Well, I guess they do. Sweet, now we can add Tuna to the list. Capt. Eric Ciocher host of the Ultimate Catch fishing show down in Florida is showing off this sweet Sea Trout caught using one of our new OOZZIE Jigs loaded with BioEdge. 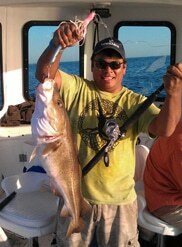 Congratulations to Rob Frye the 2011 winner of the OOZZIE Jig Big Cod Contest. This 22 pound cod, caught using a 16 ounce silver with pink squid skirt OOZZIE Jig, loaded with BioEdge Herring oil, did the trick. Here at the OOZZIE Lure Co., we have been working on our smaller fresh water jigs. We gave a few samples out so they could be tested. 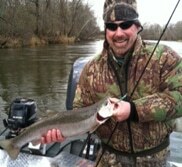 Loading the jigs with ground up salmon eggs, these anglers were able to hook up on a number of real nice steel head. SWEET! 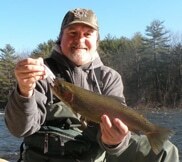 Picking up rainbows with our new 3/8oz white OOZZIE Jig, loaded with BioEdge smelt oil. We caught just about everything on the new OOZZIE JIg. Here’s more proof. That the new OOZZIE Jigs works real well in freshwater. FLUKE !! Our new 3/4 oz. OOZZIE Jig has now become an awesome Fluke teaser. Capt. Skip Chabot of the Sea Sea Rider. 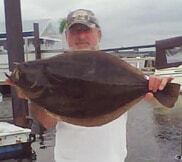 Has been able to land a number of Fluke in the 10 pound range. Very cool. 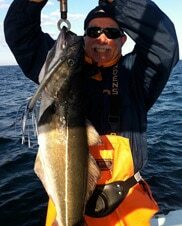 Another great catch by Capt Howard Owen of team Fish Blind down in Jersey. The OOZZIE JIg BioEdge combo kept him in fish all day. Sweet! Capt. 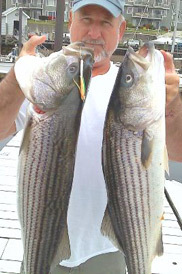 Howard Owen of team Fish Blind down in New Jersey has had a great deal of success with the new OOZZIE Jigs. Catching this monster Striper on a 4 oz. blue white jig. “Note to all fisherman from Captain Skip Chabot of the vessel Sea Sea Rider regarding OOZZIE Jigs field testing. Performance while casting was outstanding. The retrieval of this lure should be a slow to medium rate of retrieve. Occasional t…witching of the rod tip works excellent. We used this jig with squid strip enhancement. We also used BioEdge scent products, specifically herring and menhaden. 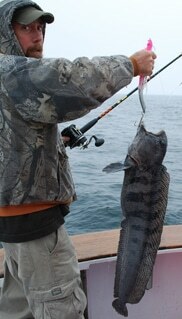 The field testing also included vertical jigging with excellent performance with or without enhancement. 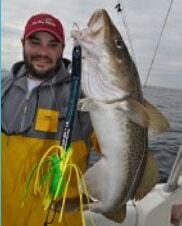 Captain’s note: while vertical jigging allow the lure to freefall on the downswing, slow on the upswing. We hooked fish with both methods. However the freefall method attracted more fish.